Dandruff is a common skin condition that happens to many of us at some point in our lives. 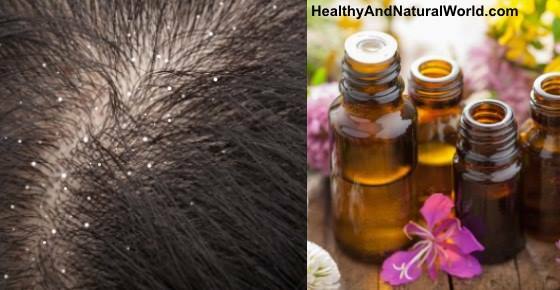 In this post I am going to cover the best essential oils for treating dandruff and how to use them effectively. Dandruff is a scalp disorder that manifests in the excessive shedding of dead skin cells from your scalp. The most common cause is dry skin, but psoriasis, eczema, and a lack or excess of scalp scrubbing/washing often play a role. If you are sure you do not suffer from dry skin, the opposite, an oily and irritated skin, can also cause dandruff, and is called seborrheic dermatitis. A yeast-like fungus called malassezia can also proliferate on your scalp and cause your skin cells to die too quickly. People with healthy scalps also shed dead skin cells, but their cells live a lot longer and thus shed in tiny amounts. Essential oils that attack fungi, inflammation, dryness, and excessive oil secretion can all be useful. If your condition is caused by skin allergies, you should avoid the food or soap that trigger your immune system’s unnecessary response. Tea tree oil. Tea tree oil is good at killing the fungus responsible for dandruff and it’s also an effective remedy for dry and itchy scalp. One research team found that a shampoo that contained only 5% of it reduced oiliness, itchiness, and scalp lesions by 42%.1 In general, tea tree is anti-fungal, anti-inflammatory, and promotes wound healing, which explains its success as a dandruff treatment. It is a versatile oil and you can find 75 extraordinary uses for tea tree oil. Lavender oil. A good, gentle moisturizer with anti-fungal and anti-inflammatory effects that also smells great, you cannot go wrong with lavender! You can also have a look at these top 10 uses for lavender essential oil. Patchouli oil. As gentle a moisturizer, anti-inflammatory, and anti-fungal oil as lavender, patchouli can do wonders for dandruff.5 You hardly have to use a carrier oil at all. You can also read my post about the best uses for patchouli essential oil. Bay laurel or sweet bay oil (laurus nobilis linn). If you want to experiment with another uncommon oil, one study has demonstrated that this oil has an anti-inflammatory effect similar to that of non-steroidal anti-inflammatories like piroxicam.8 It is a useful analgesic too, which might help with itching. Chamomile oil. Any chamomile oil has anti-inflammatory effects when applied to the skin or the scalp.9 It is also a good antihistamine against allergies.10 Chamomile essential oil is one of the best essential oils for allergies. Citrus oils. Lemon, lime, orange, and bergamot smell great and they help to regulate your skin’s natural oil production. You can also read about these 10 amazing uses for lemon essential oil. Apple cider vinegar (ACV). See my previous article on how to use ACV to get rid of dandruff. That is one problem with this fungus: it positively flourishes in oil! This is not too much of a problem with essential oils, as they are not greasy and evaporate quickly. Carrier oils, however, can be very oily. That is, after all, why we use them. To prevent your carrier oil from exacerbating your dandruff fungus, use it with aloe vera or your shampoo. To pick the right shampoo, try to work out what causes your dandruff. Pour some into the palm of your hand, rub your palms together, and then apply it to your hair as you would with any shampoo. Massage your scalp gently with your fingertips, not your nails. The most basic formula to attack the fungus and address the inflammation is one with lavender and tea tree oils. Mix 10-12 drops of the essential oils (5-6 each) for every 1 ounce (30 ml) of your shampoo. Rub the shampoo into your scalp and let sit for 5 minutes. Rinse with water, repeating once per day. If you have psoriasis, mix 1 teaspoon of aloe vera, 15 drops of patchouli oil, 15 drops of thyme oil, and 2 tablespoons of carrier oil. For eczema, use the same recipe as for psoriasis, but with evening primrose as your carrier oil. If your scalp and hair are exceptionally greasy, address it with tea tree, lemon, and eucalyptus oils. Mix 12 drops of the essential oils (4 each) for every 1 ounce (30 ml) of your shampoo. Rub the shampoo into your scalp and let sit for 5 minutes. Rinse with water, repeating once per day. The advantage of a hair rinse is that traces of the oil remain in your hair without being washed off. Choose a bucket of an appropriate size. It will either have to be small enough so that you or a friend can pick it up and pour the water over your head, or large enough so your head fits in it for a good soak. If your scalp and hair are extremely oily, add a few drops each of lemon and tea tree oils to each one liter of water. The lemon will regulate the oil, and the tea tree will take care of the fungi and inflammation. If your scalp is not terribly oily, use a few drops of lavender or chamomile essential oil per one liter of water if you think your dandruff may be caused by an allergy. You might want to leave the topical applications below on your scalp for at least an hour. Some sources recommend an overnight treatment that you apply in the evening and remove in the morning. If you want to try this, watch your condition carefully to ensure that the oil does not worsen it, and start gradually with a shorter period of time. For greasy scalp, massage your scalp with one tablespoon of carrier oil and a few drops of lemon and tea tree oils. If there is not much grease, massage your scalp with one tablespoon of carrier oil and a few drops of lavender and/or patchouli. Cover your pillow with a towel to protect it before you rest at night.